“LYN” on her path to another round of sailing for years to come. It’s easy to look at photos like this and think “yep, she’s sanded down and painted” but that sentence says nothing about the hours of time and efforts made to not only strip off the original surfaces but the washing, masking, primers, more masking and then painting - all to get that “new look” that’s so hard to come by. Tony didn’t send any photos of the sweat and frustrations that go with this process, but I encourage you to recognize that they were there. Here’s a good photo after the painting was done and he began to reinstall much of the hardware. The new “tinted” ports are in place waiting to replace the metal frames and the contoured stanchion plates along with the modified bow pulpit can be seen. Look at the original photo and then one of the later ones and notice how he changed the bow pulpit shape around the fore stay. 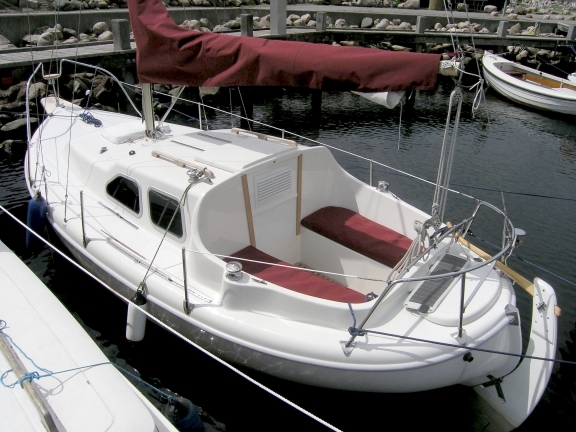 He’s also added a short but usable bowsprit somewhat like the Halman 21. 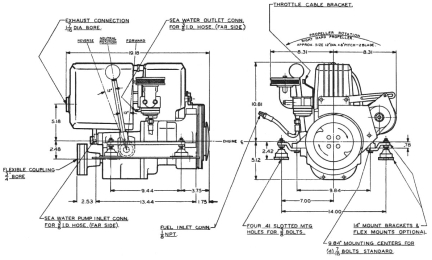 Here’s something that should be of direct interest to any Nordica or Halman owner. 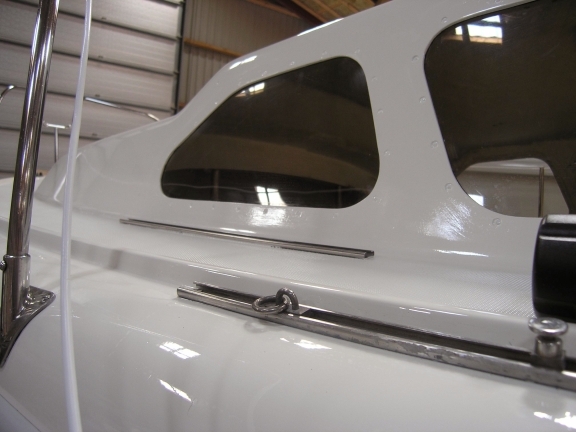 In the course of rebuilding the interior, Tony fitted a beam across the width of the cabin and epoxied it in along with the stainless posts to improve the support for the mast. This approach has kept the interior “perception” as being more open (i.e. 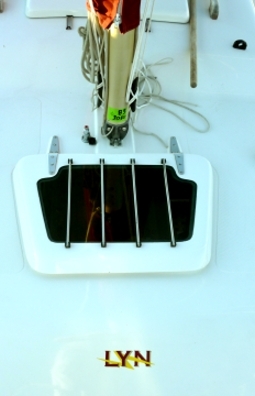 larger) and has made a significant step in the need to keep the mast from crushing the cabin top. There’s always something to learn from studying good photos and it’s not always the intended subject that the photographer expected you to see. 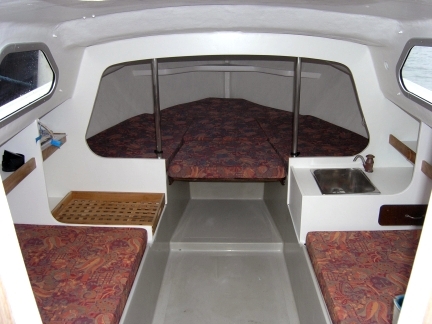 In this view, I liked the “bridging shelf” in the very forward section of the v-berth, and the freshly painted (i.e clean and smooth) interior. 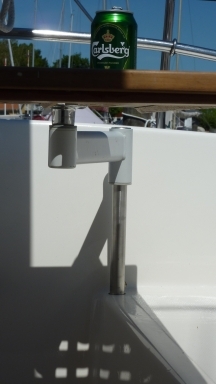 Most of you know the varied states of these surfaces in our boats - some have “super-glued” carpet, some have excessive paint drips and runs that nothing will fit up to without some creative grinding, etc. 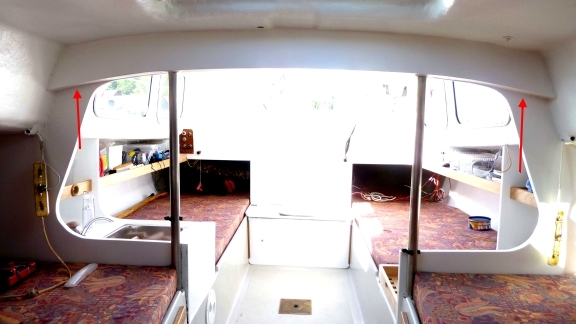 This interior is simple, clean, and low maintenance - which usually allows for more time sailing. Notice also the new “non-skid” surfaces on the sole. I didn’t see any photos of the engine or access to it but given the amount of simple and practical details he’s solved elsewhere, I would expect to see that area treated to some of the same methods. The novel “swiveling stand” mounted into the cockpit will serve quite nice for keeping your knees from getting knocked about. 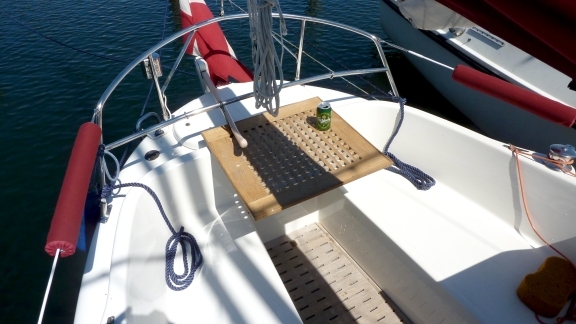 This same teak table works inside the cabin and attaches to another fitting there for dining when the weather isn’t quite so nice. This new hatch not only keeps the interior a little brighter but keeps your foot from touching down in the v-berth without the rest of your body already being there! Ouch!! Nice graphics to show off the “Lighting” - This boat surely has some new and very positive “karma” to share with the owner and crew. 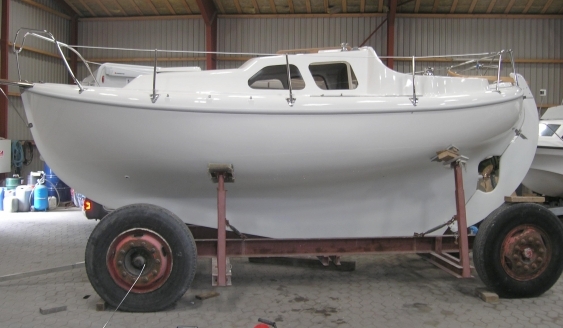 So after months of work, this is what you get to enjoy every time you see your “LYN” - and if you are in Denmark sometime, keep an eye out for this boat silently cruising by, but traveling like “Lightning” - because of someones vision and work to bring her back from another time. 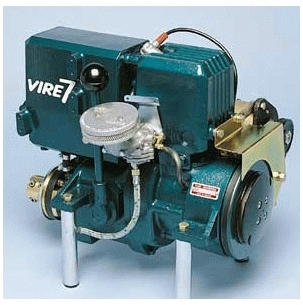 If you wanted to know what this little “Vire-7-Diesel” looked like - this is it! Simple, compact and for it’s time, quite adaptable to smaller boats where your alternative propulsion was oars! This was a great option to have in boats with limited space.